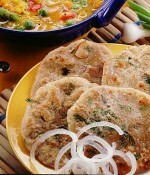 Deep fried, puffed flat bread bread which can be served with variety of sides. Best serve in breakfast with halwa, chanay/cholay etc. Coffee cake can be eaten alongside coffee (for example, as part of a breakfast meal) or that may be eaten during a "coffee break" or offered to guests as a gesture of hospitality on or around a coffee table. Simple and easy homemade bread with a tempting cheese filling. Best serve with tea or coffee.